ANNISTON, Ala. (Nov. 13, 2013) Blastcrete Equipment Company’s H-020 gunite attachment gives shotcrete contractors a powerful rotary gunite machine that attaches easily to any skid steer, requires less compressed air, and saves space on jobsites. The easy-to-operate machine delivers precise material control for projects including concrete repair, soil stabilization and refractory lining applications. The hydraulically powered H-020 is equipped with Blastcrete’s “Genuine Piccola” single point, self-leveling clamping system that ensures simple operation and minimal maintenance. The unit is equipped with a universal mounting plate for attachment to skid steers. It also features pockets so users can transport it with a forklift. While other dry-process, shotcrete gunning systems typically require three to four adjustment bolts to seal the rotor section, the H-020 requires just one. The simplified design makes it quick and easy to adjust, clean, and ensures safe, trouble-free operation. The H-020 requires a skid steer or other hydraulic power supply to deliver 10 GPM at 1,500 psi to operate at maximum speed. Since the system uses hydraulics to rotate the rotor section, the H-020 requires just 225 CFM of compressed air, which is 50 percent less than comparable, fully pneumatic gunite machines. It operates with variable speeds from 0-5 cubic yards per hour and can be used with delivery systems that exceed 500 feet. The H-020 is 34 inches wide, 34 inches long and 50 inches tall. The unit’s size makes it easy to move, and it takes up less space on the jobsite. The machine also can be loaded into the back of a pickup truck for easy transport. 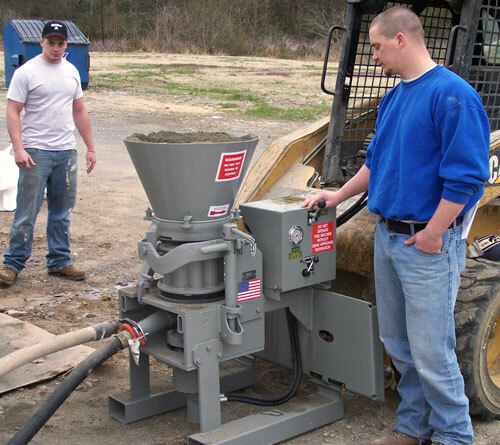 Blastcrete customizes each machine to meet customer requirements and offers free maintenance and operation training at its facility in Anniston, Ala.